This weekend GameSalad had the opportunity to participate at ACE Innovation (http://www.aceinnovation.org/ACE_Innovation/Home.html) – an all-ages-oriented public event celebrating Austin’s community of creative entrepreneurs. 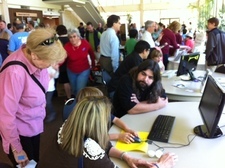 Catering to around three hundred attendees, ACE provides guest speaker presentations and community-led, hands-on educational exhibits, offering visitors an abundance of opportunities to learn in it’s interactive environment. 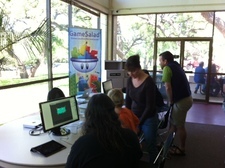 GameSalad provided a booth to demo and discuss the Creator toolkit to interested attendees, allowing kids and parents the opportunity to explore the ease of use that the tool provides.